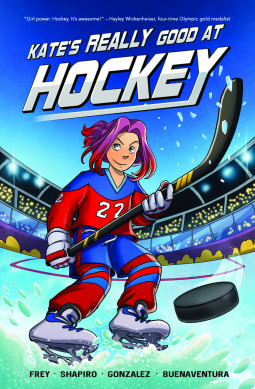 Kate's Really Good at Hockey is a story about friendships, families and mother/daughter relationships. Kate is "almost thirteen" in the text of the story, which is a rough age to balance the need for independence as well as the parents' need to protect from harm. She wants so much to be independent and live out her dream of being a hockey player, which is the part of her that's growing up and creating goals. There's also the side of her that wants everything to be fair, which real life hardly ever is. The comic never once shies away from the reality of a sports camp, that it's a lot of hard work and practice; as much as the head coach seems like the bad guy, nothing she says is actually wrong. Kate's rivals are like every other catty girl that had ever been present in school, so readers will definitely be familiar with that kind of personality. My daughter and I really enjoyed this book together. Thanks so much for the wonderful review! The book (my very biased opinion) tells such a sweet story and I love the characters so much. Thanks again for the amazing review, it means a lot! !